The scalable Tennessee map on this page shows the state's major roads and highways as well as its counties and cities, including Nashville, the capital city, and Memphis, the most populous city. To display the map in full-screen mode, click or touch the full screen button. To zoom in on the Tennessee state road map, click or touch the plus (+) button; to zoom out, click or touch the minus (-) button. To scroll or pan the zoomed-in map, either (1) use the scroll bars or (2) simply swipe or drag the map in any direction. (The scrolling or panning method you use will depend on your device and browser capabilities.) At any time, you can display the entire Tennessee road map in a new window or print this page, including the visible portion of the map. Tennessee's Interstate Highways connect its major cities and facilitate travel between Tennessee and its neighboring states. I-24 crosses central Tennessee from southeast to northwest. I-26 crosses eastern Tennessee from north to south, providing access to Kingsport and Johnson City from I-81. I-40 spans the state from east to west, while I-65 traverses central Tennessee from north to south. All three of these Interstates pass through Nashville. I-75 crosses eastern Tennessee from north to south, passing through Knoxville and Chattanooga. East of Knoxville, I-81 splits off I-40 toward Virginia. Tennessee's auxiliary Interstate Highways serve the cities of Knoxville, Memphis, and Nashville. I-275 provides access to central Knoxville from I-40 and I-75, while I-640 loops around the north side of Knoxville. I-140 provides access to Knoxville's southern suburbs from I-40. I-240 loops around the southern side of Memphis. I-440 loops around the south of Nashville, linking I-40 to the west with I-24 to the east. The eastern border of Tennessee offers a 400-mile road trip from Ocoee to Mountain City with spectacular views of the Great Smoky Mountains. Travelers can raft or canoe on the Hiwassee River (running parallel to Route 30) or go for a hike along its banks. The U.S. Route 441 Scenic Parkway provides access to Pigeon Forge and the Great Smoky Mountains National Park in eastern Tennessee. Visitors to Great Smoky Mountains National Park can see Cades Cove, an old community first settled in 1818. The drive also passes through Davy Crockett Birthplace State Park, and the Cherokee National Forest. 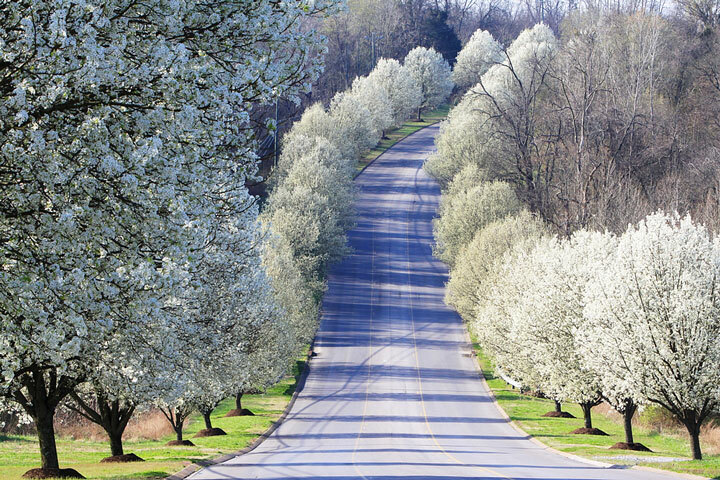 More information about scenic roads in Tennessee is available on this America's Byways: Tennessee page. For more information about Tennessee's roads and transportation infrastructure, visit the Tennessee Department of Transportation website. For Tennessee road traffic conditions, visit the Federal Highway Administration's Tennessee Traffic Information page. Tennessee-Map.org is a State Maps reference source.